Director: Thomas Clough Daffern B.A. (Hons) D.Sc. (Hon) PGCE Ph.D. Chair: Dr. Lynne Sedgmore OBE. Many new publications on the Institute's themes are available for purchase from the Institute office, and a comprehensive catalogue of publications printed by the Institute has now been added to this website. This represents a major new development in the life of the Institute. The Institute is unique among research centres throughout the world in that it combines training and practical work in conflict resolution with studying the entire range of global philosophical and spiritual traditions, together with the proactive search for global responsibility and justice in our time. Founded in 1990, arising out of a feasibility study investigating the possibility of creating a Peace Studies Institute (PSI) in the University of London, and subsequent years of active educational research, networking and consultancy, everyone interested in advancing peace studies in London, the UK, and internationally is invited to join us. The Institute has also built on the work of Philosophers and Historians for Peace, an international networking organisation founded in London in 1985. IIPSGP Members are a scattered international network of scholars, teachers, students, thinkers, academics, faith leaders, and visionaries involved in a wide range of educational and research activities in both professional and voluntary capacities in all aspects of peace research, environmental education, comparative spirituality and philosophy. With our unique library and archive on peace research and global philosophy (catalogued partly online) the Institute acts as a support structure and information clearinghouse to empower individuals to develop their own research and action projects in the fields of peace and global ethics and works co-operatively alongside many other institutions and professional networks worldwide. We organise meetings, seminars and lectures programmes, while regular seminars have been held in the House of Lords focusing on 'Conflict Prevention and Peacebuilding', 'Ethics, Politics and Economics', 'Social Development and Global Justice'. A 'Peace and Global Responsibility Studies Course" is available, combining independent study, correspondence tuition, teacher training, service work in the community, and occasional peer group seminars & study retreats. A small Secretariat and Advisory Council service the work of the Institute, which is a voluntary educational charity, along with volunteers and interns; for internship/ student / faculty positions (for consideration of which, membership of the Institute is a preliminary requirement). The Institute supports the work of the major interfaith organisations worldwide (World Conference on Religion and Peace; World Congress of Faiths; United Religions Initiative; Initiative for a UN Decade of Interreligious and Intercultural Dialogue, Understanding and Cooperation for Peace; World Parliament of Religions; World Network of Religious Futurists; etc.) The Institute also supports the work of scientific and secular organisations working for planetary change, peace and transformation, such as UNESCO; ALESCO; Scientists for Global Responsibility (SGR); The International Peace Research Association (IPRA); PUGWASH; The Conflict Research Society; The Union of Imaginable Associations; The International Union of Associations (AUA);etc. The IIPSGP Director has served in an official capacity for several of these organisations, both in the interfaith and scientific communities. Uniquely positioned across the secular-spiritual divide, as befits a philosophical and academic institution, IIPSGP calls for dialogue between scientists and spiritual thinkers worldwide to advance rational discourse, dialogue and research into the ways and means of securing a peaceful global society. The Institute founded and runs the pioneering MULTIFAITH AND MULTICULTURAL EDUCATION AND MEDIATION SERVICE serving in situations of conflict or violence involving a religious or cultural dimension. The MMMS is run as both a consultancy and voluntary effort and is available for situations needing outside intervention to resolve, and tackles disputes ranging from the small to the very large. We have also recently inaugurated Just Justice as an advocacy project for conflicts in which mediation is inappropriate and there is rather need for legal help and advice. We have also founded the COMMONWEALTH INTERFAITH NETWORK linking together educators, peace activists, environmentalists, human rights and social development specialists from Commonwealth member countries helping to transform the Commonwealth into a vibrant community of nations bearing witness to a wider world order based on peace and a love for common values and spirituality. The IIPSGP Director is a British-Canadian dual citizen. IIPSGP also aims to establish eventually a Global Peace School for children. Meanwhile, THE GLOBAL GREEN UNIVERSITY , founded by IIPSGP in 2000, is an international network of educators and activists committed to building a peaceful, just, ecologically sane, cooperative and sustainable global society which accepts students for higher degree research on topics of importance to global well being. (Alternative energy, new management studies, communications, transpersonal knowledge, new physics etc.). THE TRUTH AND RECONCILIATION COMMISSION FOR BRITAIN AND IRELAND is an important project of IIPSGP and is a forum for those who were or are involved in the bitter conflicts over Northern Ireland to come forward and share their sorrow and remorse, and also to build a positive future of peace for both islands – it stands for celebrating the cultural differences of Christian and Druid, Catholic and Protestant, plus all other faith traditions of Ireland and Britain, republican and loyalist, in a spirit of amity and intelligence. It has met in Holyhead (2006), Dublin (2007) and it's next meeting in Belfast (July 25 2009). THE TRUTH AND RECONCILIATION COMMISSION FOR THE MIDDLE EAST is a similar project launched to establish common ground and dialogue between the parties involved in Middle Eastern countries, and it calls for reconciliation between Israel and Palestine (based on a lasting, just, two state solution and total mutual nonviolence); the withdrawal of USA and UK troops from Iraq and their replacement by a UN peacekeeping force (made up from mostly Islamic countries); the immediate total cessation of all acts of terrorism as non-Islamic (suicide is illegal in Islamic spiritual law). The TRCME met in Israel and Palestine in August 2008 and a film of the meetings is available on www.holisticchannel.org.uk . The subsequent tragic outbreak of fighting over Gaza makes this work even more important than before and we hope to return for further discussions in Israel, Palestine and Egypt in August 2009. The TRCME is also calling for a negotiated truce and peace agreement between all forces currently fighting in Afghanistan, and the replacement of the search for military solutions with the search for intellectual, educational, theological, spiritual and philosophical solutions. There is no reason why according to Islamic teachings, peace and reconciliation cannot be restored between all parties. The Quran, the Hadith and the Islamic spiritual teachings of all denominations urge peace and reconciliation as the primary duty on all Muslims – whose very name means peace. Likewise to Christians, whose founder revered peace above all – and stated that peacemakers shall be like Children of God. The TRCME seeks immediate theological reconciliation and peace making between the faiths and parties of the Middle East in a new unbreakable covenant which can make genuine peace, security and wisdom the priority for all in the region. Diplomats and politicians alone cannot make peace in the Middle East – they have failed miserably for too long. Instead, spiritual Saints and faith leaders, Sages and secular thinkers, Sufis, Kabbalists and Christian mystics, learned scholars and scientists, intellectuals and artists, musicians, philosophers and poets, women and young people … all must help with their work and encourage an end to the cycles of violence in the region. It is time for the people of peace in all lands to speak out, silently, in their hearts, and invoke the ancient power of wisdom to heal the region. The Institute is also involved in working towards the establishment of a EUROPEAN UNION MEDIATION SERVICE – after the debacle of war in the Caucasus in August 2008, when Russia and Georgia fought over South Ossetia, and the “Gas Conflict” between Russia and Ukraine, and the tragedy of the Gaza conflict in 2009, it is now an imperative, in the eyes of IIPSGP that a new professional mediation service be established for the European Union by Treaty. Europe has been the origin point of two vast world wars in the 20th century, and a host of other smaller conflicts. We urge that is should now become the seat of the establishment of a lasting institutional mechanism for the solution of conflicts before they reach the level of violence. The Muses Voice is a local occasional newsletter produced mainly for the residents of Loch Goil and the Cowal Peninsular in Scotland who may be interested to know what is going on at the Castle of the Muses and its environs. IMFF – Founded in November 2011, the International Metaphysical Film Festival aims to establish a creative online platform for the screening of films that will inspire audiences to reflect on contemporary issues of science and spirituality, the solutions needed for the challenges we face in the 21st century and the timeless metaphysical human quest for meaning and purpose. The online festival will feature two days of independent film screenings from around the world, talks and discussions broadcasting live from Scotland providing an opportunity for filmmakers, experts and audiences to communicate and connect in person and online. (holding a conference in Rhos Gallt, Llanerfyl. Powys, Wales SY21 0ER on Saturday July 19, 2009) the Stonehenge Eisteddfod (which meets annually in Amesbury, Wiltshire on June 21st). The main ongoing work of the Institute is to continue playing its part in laying the intellectual, ethical and educational foundations of a sustainable, global civilisation based on peace and justice. Your contribution towards IIPSGP's programmes of work is invited and your completed membership application will be warmly welcomed. Institute members may get involved in any or all of these above projects. Together, we can do what is impossible alone, in a world in increasing danger and need. Our focus is on finding together the positive solutions to our global crisis. We ALREADY have contacts and members all over the planet and seek to build further the foundations of a vibrant, multifaith, multicultural, and peaceful global civilisation based on the wisdom found within all faiths, all cultures, and all traditions. We strongly believe in the possibility of transforming our world based on fear, hatred, illusion, greed, injustice, ignorance and violence, into a world based on peace, justice, wisdom, love and generosity – please join us in this vital work. Your support, membership and contributions are most welcome. 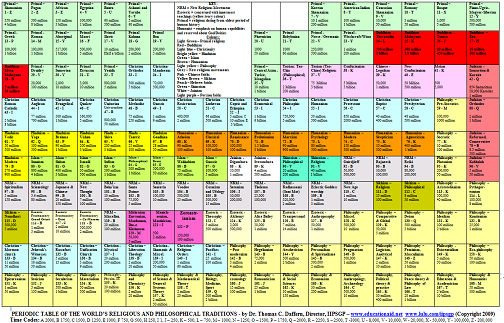 The Periodic Table of the World Religious and Philosophical Traditions (PTWRPT) is a new attempt, based on integrative, comprehensive and transpersonal historical methodologies, to codify, categorise and present the entire range of human spiritual, intellectual and scientific discoveries and approaches over the history of our species. Taking the ideas of Mendeleyev, (to group all the atomic elements in systematic order), the PTWRPT does the same with the entirety of religious and philosophical teachings. It is a unique project devised and produced by Dr Thomas Daffern, IIPSGP Director, based on many years of teaching and research and the objective and scientific study of the worldï¿½s traditions. It can be used in schools, homes, colleges, universities, religious establishments and seminaries, government departments, NGOï¿½s and campaigning groups, and by scientific researchers, indeed wherever objective and factual data about the various traditions of the world is needed. It is quite simply the most up to date and comprehensive such data source in existence, yet presented in a deceptively simple manner of display. Its raison dï¿½etre is the enlightenment point of view, that by learning more about each otherï¿½s intellectual and spiritual positions, the people of the world can cease their tribal turf wars and get on with celebrating, enjoying and loving life.